The Las Vegas School of Shotokan Karate’s training program combines the mental and physical disciplines necessary to improve one's strength, flexibility, speed and mental alertness. Our program is designed to advance each student using a “step-by-step” approach toward his or her development in Shotokan Karate. 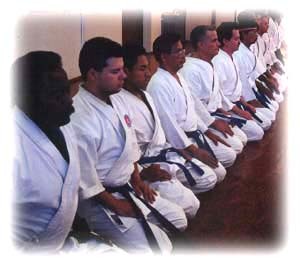 Each class begins and ends with a brief meditation as a way to prepare the mind and the body for karate training. Basic training consists of going over the blocks, punches, kicks and stances. 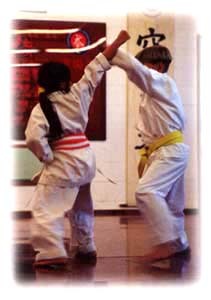 Students also learn forms or katas, which are set combination of moves and different types of kumite or sparring. One of the most important aspects of our program is the emphasis on our student's SAFETY. Highly trained instructors closely monitor all activities. 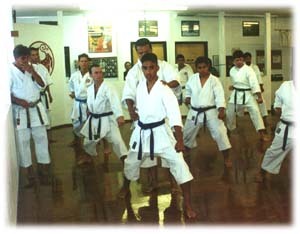 Kihon or basic techniques are taught to the new student, which consists of blocks, punches, kicks and stances. Kata or form is also taught to the new student. Kata is a set combination of karate techniques done in a particular pattern against multiple imaginary opponents. Kumite or sparring is taught the brand new student. It is called gohon kumite or basic five-step sparring. It involves the application of the basic techniques (kihon) that he or she has learned so far. The new student is also taught the correct manner and etiquette involved with karate training. The orientation class is specifically designed to help prepare the new student to go and start training in the regular class. Please go to CLASS SCHEDULE page to see days and times of the Mandatory Orientation Class For New Students. Junior students must be at least 6 years old to join the Junior Class. Kids between 5 and 6 years old are evaluated to see if they are eligible to enter the class. 15 years old and above students must enter the Adult Class. All students must wear a dojo patch in their karate uniform. All students must purchase a dojo student handbook. Students must understand that they are committed to train at least two to three times a week in order to develop properly. Students are expected to adhere to the guidelines of the school and are expected to act with sincerity in their karate training following the code of ethics (manner, attitude, etiquette) that are set within the dojo (karate school). Virtually everyone is welcome to join Las Vegas Shotokan Karate. To those who are interested, we encourage you to come and visit the dojo. Please call us @: (702) 873-0891 or email us @: jamest@lvshotokan.com to setup an appointment for a visit. Why choose our dojo over others? What sets us apart from other dojos? What do we offer our students?